Home/Dressage, Equestrian Coach, Eventing, Horse Riding, Horse Riding Instructor, Show jumping/Back in the game! I cannot even begin to explain how happy I am to be getting my life back together again! Some of you will be aware that three months ago, I underwent some fairly major surgery for an ongoing health issue, which meant that I simply had to put everything on hold for 3 months. It’s not the first time that I’ve been forced to put my life on hold through hospitalisation, and while my health issues thankfully weren’t life threatening, they were certainly having a huge impact on my quality of life, so I knew that I had to get fixed. Those who know me will be fully aware that I’m not very good at being on ‘box rest’, and how my amazing hubby has put up with me at home, I’ll never know! I’m incredibly lucky to have some fantastic friends & family who have supported me throughout recovery, and I’m absolutely thrilled that so many of my teaching clients have patiently waited for me to recover & get to the point where I can go out and see them again. I can hand-on-heart say that I do get to meet and work with some of the most lovely horse owners, and it has been brilliant to see them again after such a lengthy time out of action. It’s clear that most have been diligently carrying out their homework while I’ve been away, and I’ve loved receiving their updates & messages. 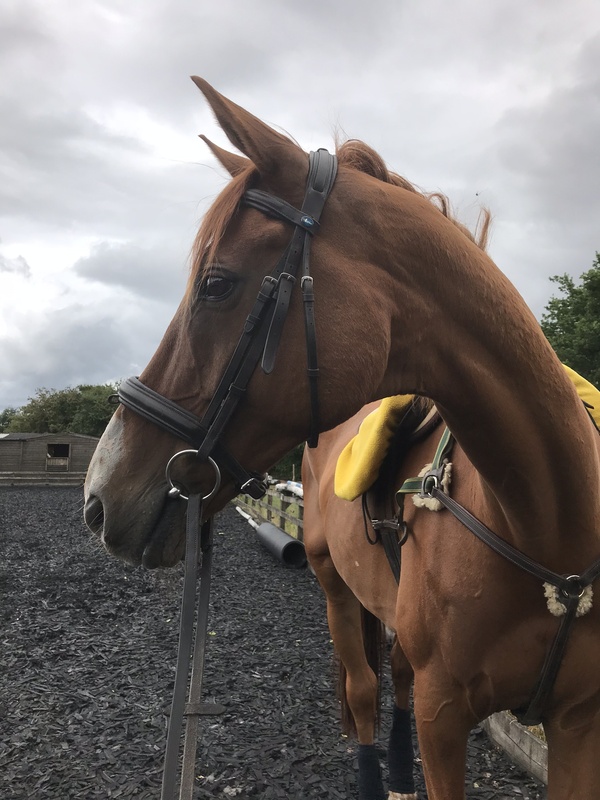 It is brilliant going out & seeing how much progress both horses & riders have made in my absence, and how well they’ve implemented some of the training tactics we were working on before I went AWOL. It hasn’t always been plain sailing; I’m the kind of person that if I’m doing something regularly, then I’m happy and confident, however if I have a break for any reason, I begin second-guessing myself. I’ve been really worried that I’d lose touch with people, that I’d suddenly lose the ability to coach riders or to offer useful guidance. However now I’m back out and about, it reinforces just how much I love teaching; it’s just so rewarding to see riders gaining confidence & skills, together with horses understanding the questions being asked of them. On reflection, I guess this mirrors what happens to so many horse riders who for some reason have to stop and adjust their focus for a while, then really struggle to find their mojo again. I haven’t been wasting my time while I’ve been off games though! I’ve been on the look out for training events & courses to help me gain experience & qualifications in equestrian coaching, looking at which equestrian events I plan to go to for inspiration, plus working on some pretty cool ideas to reach a wider audience online. I think the thing that has been the most fun while I’ve been off, has been my Facebook Client group, where I had this crazy idea to set weekly challenges for my riders, to help keep them on track. I’ve have absolutely loved hearing how people have tried the exercises & what they’ve learnt along the way. I didn’t expect as many people to get involved as they did, and it really gave me a boost during those dark days while I felt like I’d been run over by a bus. So now I’m gradually getting fitter and stronger, and I’m back out teaching, I’m excited for the future. I hope to bring you some news in the very near future of some great developments and opportunities, so watch this space!